When Allen Cantrell, Boatswains Mate Third Class of Coast Guard Station Lake Worth Inlet heard that a local group asked for a guest speaker to tell of Coast Guard life, there was no hesitation. His reaction was,” I’ve never done this before, but I love Coast Guard life, and the sea, and I really enjoy the boats”. Petty Officer Cantrell was given the honor to represent the United States Coast Guard. Amongst his many qualifications, he was also a qualified coxswain, trained to drive and be in charge of his boat. Following a short resume beginning with “Ladies, I’m Allen Cantrell and I come from South Carolina”…. I could tell from the murmurs the ladies liked this non-assuming low key approach. Cantrell bravely weathered being peppered by a barrage of questions; he had no idea what to expect. He soon learned that the ladies have “been there and done that”. He conducted himself in a manner befitting an old hand at public speaking, guiding the questions and tailoring his answers so as to satisfy his audience. His love of the Coast Guard showed in every answer. If he was running for office, I would have voted for him. 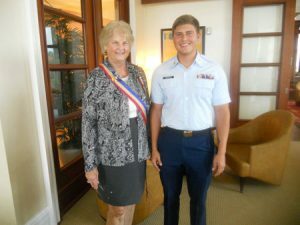 I was so proud of him and for the Coast Guard for sending him. Today was small payback for the kindnesses’ the Society has shown our veterans since the Spanish American war to the present day and their support of our ROTC’s and reserves in colleges and schools. I had to physically drag Petty Officer Cantrell away from the ladies, as duty called.